The Warner Robins Parks and Recreation Department offers an exciting football and cheerleading program for boys and girls ages 5 to 12. Our program provides an opportunity for youth to participate in a fun, organized and safe football and cheerleading environment. Emphasis is placed on having fun playing football and cheering while learning basic skills of the game. Registration for the 2019 Youth Football and Cheerleading program will begin May 28th. Registration will continue Monday through Friday, from 8 a.m. to 6 p.m. the first week of registration, then Monday through Friday 8 a.m. to 5 p.m. until leagues are filled. A birth certificate is required upon registration unless it is currently on file. The child’s weight will be required at the time of registration for football. Each child, for football, will be issued a helmet, a pair of shoulder pads, two pair pants (game day pair & practice pair) and a football jersey. Participants must furnish their own Mouth Piece. Child will keep football jersey but all football equipment will be picked up after child’s last game. Each child, for cheerleading, will be issued a cheerleading uniform and a set of pom-poms which they will keep. For more information, call 478-293-1070. Registration will only take place in our office at 800 Watson Blvd. The age control date is August 31st of the current year for all leagues. Please note there are no exceptions to the age control date. 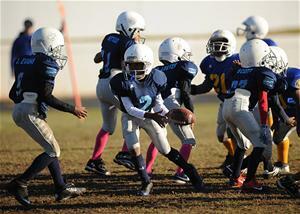 The Youth football and cheerleading recreation season runs September through mid-November. Practices will be held at fields located throughout the county. Games will be played at the football complex at Tanner Park. One offense coach and one defense coach will be allowed on the field. Weight unlimited, with the exception that no player weighing over 100 lbs will be eligible to play any backfield position. Weight unlimited, with the exception that no player weighing over 140 lbs will be eligible to play any backfield position.